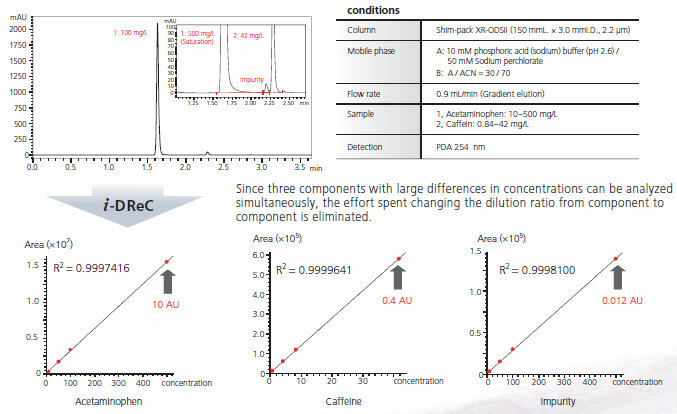 i-DRec is a new analytical method that significantly extends the dynamic range. It enables the analysis of high-concentration samples without diluting them, and ensures a correct calibration curve. Simultaneous Quantitative Analysis of Components with Large Differences in Concentrations. An example of the simultaneous quantitative analysis of acetaminophen, caffeine, and an impurity, which are included in an over-the-counter cold medicine, is shown below. Calibration curves of high-level acetaminophen and a trace-level impurity can be created from the single analysis data.